Handmade travel journal with printed as well as hand stamped, hand distressed and hand decorated pages. When I travel, I always keep a travel journal. During my trip, I carry a little bag that contains my journal, a pen and a glue, so I miss nothing. After many trips, I have observed that it is easier to record facts, observations and feelings as they happen. Every time I had gathered the photos, to make the book upon return, they remained in the "future projects" box. Even if I managed to make the book, it was missing the highlights - small details that were not crucial to the trip but gave meaning to the whole adventure. The last few years, I keep a journal with me and spend about 20 minutes a day to keep it up to date. When I return home, I have my book completed, my memories on the shelf, and I am ready to go on. The covers have many layers of vintage collage elements, paint and special mediums and pastes, to achieve a "weathered" look. Although the surface looks "rough" and well-used, it is treated with wax and special mediums, and has a surprising soft and velvet touch. On the front cover, there is a rusted metal plaque giving the definition of Wanderlust. The finish has been made with several layers of ecological varnishes, to protect the artwork and ensure the vitality of colors for many years to come. It contains 84 pages (counting both sides)- some printed , and the rest hand stamped, distressed and decorated by me. All pages are of high quality recycled paper of 240 gsm, in a very beautiful creamy tone, that makes it look old. It is also acid free, chlorine free and suitable for photos. The spine is a very soft man made leather in brown and has metal hanging decorations and charms. I have included an empty clasp as I wanted you to add something significant from your journey, in order to make the journal truly yours. It is bound using strong 3-ply Crawford's Irish linen thread in walnut brown. Its size is 15 x 20.5cm ( about 6 " x 8" inches). With the journal, I have included a pen - pocket, for you to have your favorite pen always near you. The pen of the photo is not included - only the pen pocket. 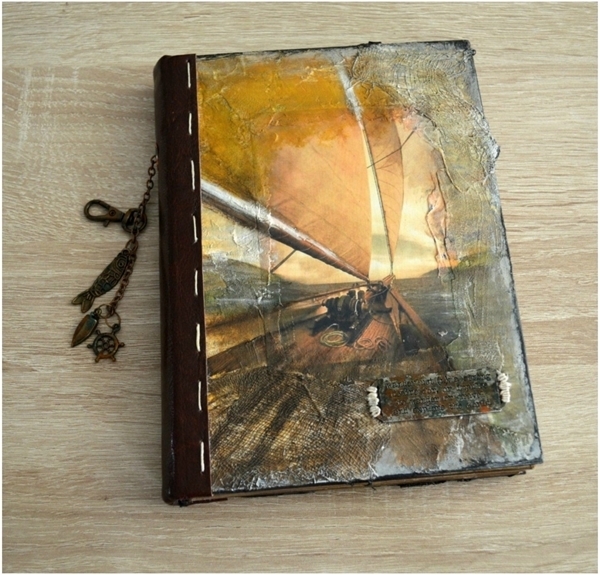 It can be used as a journey journal, a travel journal, a ship's log, a sailing journal, a traveler's notebook, a writing journal, a diary, a journal for a field trip, a sea journey, a Paris vacation, a trip to Africa or a journey to your soul. It is also a great gift . It can be used as a memoir, a diary, a photo album, or a special heirloom journal where you will tell the story of your life for the generations to come. It is a unique and special book. It comes with its own white canvas bag, to be stored safely and/or be nicely presented as a gift.